If you are looking for a little comfort, look no further than this classic, easy chicken casserole recipe with cheese, served on puff pastry shells and topped with buttery crackers. 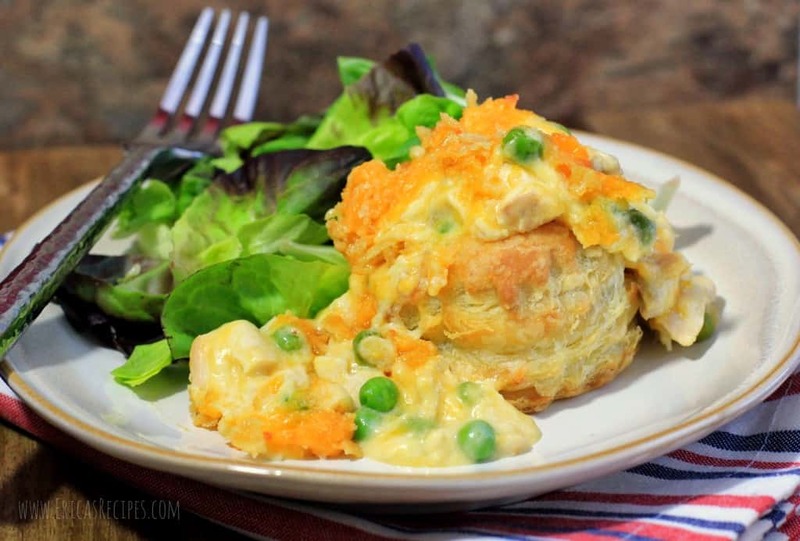 Cheesy Individual Chicken Casserole en Puff will hold your hand, give you a hug, let you cry on its shoulder then still tell you you’re pretty …whatever you need. 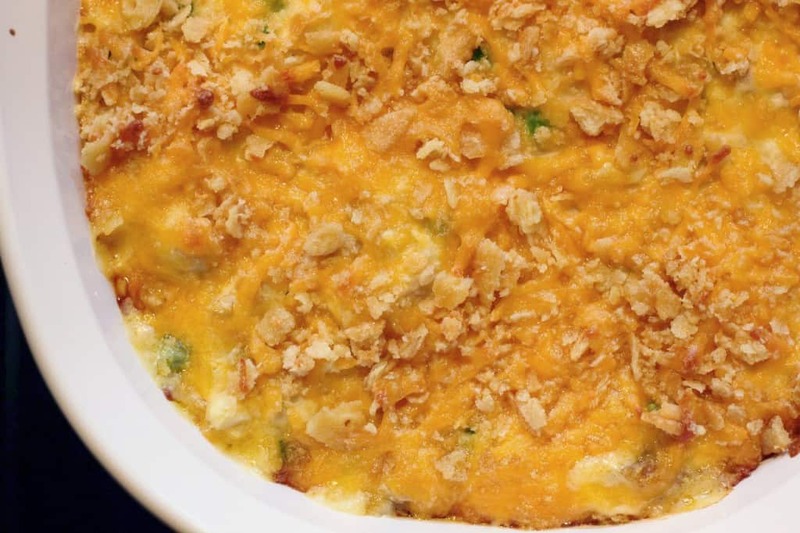 I first had a dish similar to this easy chicken casserole at a family reunion a couple years ago in Woodstock, Virginia. My husband’s grandmother Bettie made it, and I think I might have actually licked my plate clean in front of her (probably not a good move on my part, but it was that good). You know when you go to a family reunion in the sticks in Virginia, and you are going to get some crazy good food. Like Grandma Bettie’s “Warm Chicken Salad” as she called it. 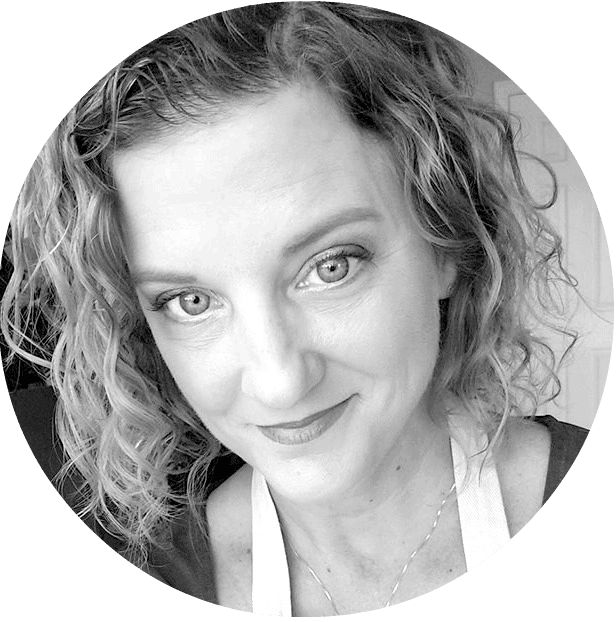 And macaroni and cheese, and lasagna, and squash casserole, and biscuits, and…. Well, you get the picture. So in my recipe, I decided to take the warm chicken salad or easy chicken casserole or cheesy chicken bake or whatever you want to call it, and give it a little something else. I didn’t want to add pasta and I didn’t want to make pie crust. Spooning into crispy, buttery puff pastry shells was the answer. And peas. When I took the first bite, I think I might have even cried a little. Annnd this chicken casserole reheats SO well the next day (by itself, not once it i over the shells). And the day after that. I have all the love in the world for this cozy recipe! So that’s it folks. 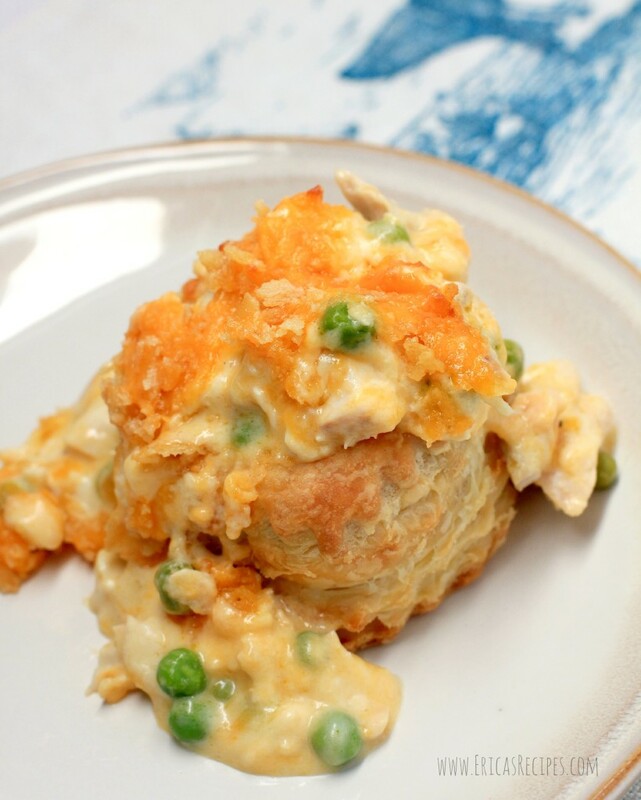 Love served up in a creamy chicken and cheese bake spooned over crispy puff pastry shells. Deliciously cozy, approachable ingredients, for a classic dish remade. 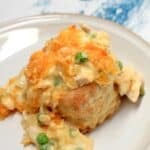 If you are looking for a little comfort, look no further than this classic, easy chicken casserole recipe with cheese, served on puffed pastry shells and topped with buttery crackers. Remove the meat from the chicken bones, discarding the skin and bones. Chop the chicken into bite-size pieces. In a large bowl, combine the chicken, peas, soup, sour cream, pepper, and 1-1/2 c cheese. Spoon mixture into a 2-qt baking dish. Combine the remaining 1/2 c cheese, crackers, and butter. Sprinkle evenly over top of the casserole. Bake 30 minutes, uncovered, until bubbly. Remove from the oven and set aside. Increase the oven temperature to 425F. Remove the pastry shells from the package and place on a bake sheet with the "lid" side up. Bake according to package directions. To serve, place a puff pastry shell on the dish. Using a fork, pry off the "lid". Spoon casserole into the shell and enough so it is overflowing. Repeat with the remaining shells and serve immediately. Amazing comfort food! I know this will be a family favorite, I can’t wait to make it for them. Thank you for sharing at Turn it up Tuesday! This looks wonderful! I might have to try to find an alternative for the puffed pastry or we’ll have carb overload and upset stomachs ! I love cheesy chicken so that’s definitely something on my list to try and figure out! I am totally making this one, bookmarked!! Wow, this looks like a plate of deliciousness! Thank you so much for sharing this with us at Treasure Box Tuesday- I’m sharing on Google+! This looks really good so I will try it. I’m not too experienced with using puff pastry. What do you mean by the lid and what do you do with it after it peels off? Thanks!